Thirty-nine percent (39%) of small business owners are seeing a return on investment from social media. That is according to a recent survey by Manta, released just last week. Now you might think that 39% isn’t so positive, if more than 60% are not seeing a return. However, let’s put it in perspective with the other findings of the survey. When you do that, the small business attitude toward social media looks far more positive. Small businesses are dedicating significant people to social media — Seventy-four percent (74%) of small businesses have at least one person dedicated to social media activities. Clearly, small business owners must think it is worthwhile to dedicate precious human resources to social media. Small businesses don’t have teams of people that they can deploy, like large corporations. Small businesses are spending significant time on social media — The overwhelming majority (81%) have increased the amount of time they are investing in social media or stayed the same, compared to a year ago (actually, 49% increased their time, and 32% are spending the same amount of time). 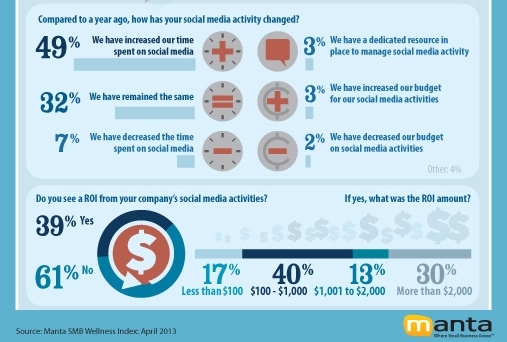 Only 7% decreased the amount of time they spend on social media. So clearly, small business owners must be seeing some value if the vast majority continue investing time in social media. In a small business, time IS money. You don’t spend it without good reason. Small businesses plan to invest in social media for Q2 — When asked what they plan to invest in, during Q2 of 2013, social media was included along with online advertising and marketing as the second highest area. Thirty one percent plan to invest in generating sales, and 26% plan to invest dollars in online advertising/marketing/social media. By contrast, only 12% plan to invest in traditional marketing, and just 2% plan to invest in mobile. Some have been able to pin down a dollar return — Of those seeing a return on investment, thirty percent have achieved more than $2,000. Thirteen percent have achieved ROI of between $1,000 and $2,000. Taken all together, it suggests that small businesses are seeing benefits, because they keep devoting the resources to social media. However, not as many have seen a clear return on investment from social media quantified in actual dollars. Still, just because you can’t pin a dollar amount to it, doesn’t mean it is worthless. There are many activities in a business that add value but are hard to pin down in dollars. One possibility is that small business owners are still experimenting to find what works best. After all, we know that social media is complex. Not every social site works for every business. It takes time and knowledge — and trial and error — to figure out how to get a return on investment from social media. Other interesting factoids from the survey are that Facebook is the site small businesses have the most difficulty maintaining. LinkedIn and Twitter follow, in that order.